and Barrus 'The power behind the brands'. The OWMVC is pleased to present a few pages on our activities, members and forthcoming events. If you would like to join us then come along to our rehearsal on a Thursday night. Mae Côr Meibion Cymry Rhydychen yn falch i gyflwyno rhywfaint o dudalennau ar ein gweithgareddau, aelodau, a digwyddiadau i ddod. Os hoffech ymuno á ni, dewch i glywed ni yn ymarfer unrhyw nos iau. The choir was formed in 1928 by Welshmen who had come to Oxford looking for work at William Morris's car factory and Pressed Steel. Today the choir is more mixed. Many of us are English (although some may have a few drops of Celtic blood!). 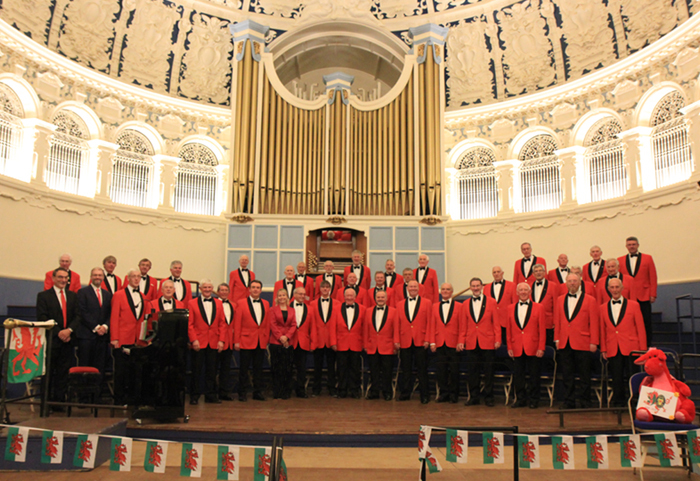 As a Welsh choir we sing in the traditional 4-part male voice style (1st & 2nd Tenor, Baritone and Bass) and a good proportion of our repertoire is in the Welsh language. Did you know that as well as singing for pleasure, our performances help to raise many thousands of pounds each year for local charities. We are also available for hire for Weddings and other functions. To find out more please contact us or visit our booking page we will gladly discuss your requirements. As with any choir we are always looking for new members, please come to a rehearsal and give us a try. We welcome contact from all visitors to this site; whether they be Choristers, Charities, Event organisers, or Interested Surfers.